566019-18VW Maat XS, S, L, XL, XXL, 2W, 3W. 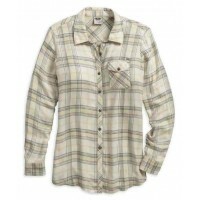 Women's Relaxed Fit Long Sleeve Plaid Shirt. 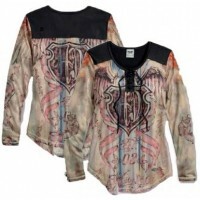 Made ..
566163-16VW Maat XS, S, M, XL, XXL, 1W, 2W en 3W. 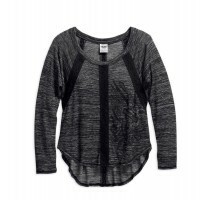 Woman's light weight lace insert sweater. 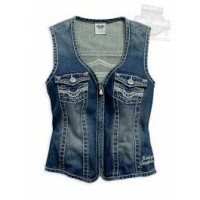 Th..
569123-15VW Women's Core Embellished Denim Vest - 99% cotton denim, 1% spandex. Scoop neck. Zippe..
569162-16VW Maat XS, S, XL, XXL, 1W, 2W, 3W. 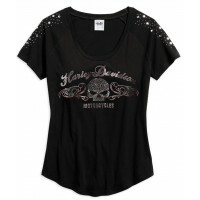 Women's Lace Accent Elbow Tee, Off-White/Bl..
569164-16VW Anything matches the Scroll Willie G Skull Scoop Neck Tee... jeans, cutoffs, leggings..
569188-17VW #1 Skull Denim Shirt. 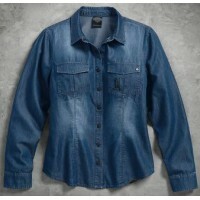 65% cotton, 35% tencel washed for soft, faded appearance. Snap ..